Prince Harry and Meghan Markle’s royal wedding is almost here, and we couldn’t be more excited. After a yearlong courtship, the pair announced their engagement in November 2017 and have spent the last six months planning what will no doubt be a beautiful wedding. As folks around the world prepare to celebrate this exciting day, it might be good to catch up on the wedding details that have been confirmed, proven false or widely speculated on. It’s always good to be in the know, right? Here’s what you know should before Harry and Markle head to the altar in a few days’ time. The wedding is happening on Saturday, May 19. The festivities will kick off around 12 p.m. GMT, which is 7 a.m. EST and 4 a.m. PST for us Americans. The wedding will be held at St. George’s Chapel at Windsor Castle. According to Kensington Palace, after exchanging vows, Harry and Markle will lead a parade through the streets of Windsor, riding in a horse-drawn Ascot Landau carriage the couple chose themselves. It’s something Prince William and the Duchess of Cambridge did on their wedding day. In fact, every British royal couple has gone on the traditional horse-drawn carriage ride right after their wedding ceremony. Then they’ll head to the reception. People magazine reported that the wedding reception luncheon will be hosted by Queen Elizabeth II, and it will be held at St. George’s Hall at Windsor Castle. Later, Harry and Markle will host their own reception at the Waterloo Chamber, St. George’s Hall and the Grand Reception Room within the castle. As early as January of this year, all of Britain began preparing for the huge influx of tourism that will likely come with the wedding. When Prince William and the Duchess of Cambridge tied the knot in 2011, 350,000 tourists came to the U.K. for the big day. Britain’s Office of National Statistics is already expecting similar crowds around Harry and Markle’s wedding date as well as a $680 million boost to the U.K.’s economy because of the wedding. The couple was granted formal permission to marry by Queen Elizabeth II in March. British law states that the first six people in line for the throne must have the current monarch’s permission before getting married. Should any of them marry without formal permission, they give up their right to ascend to the throne as well as the right of all their descendants to do so. Harry is currently fifth in line, right behind his niece, Princess Charlotte, meaning he had to have his grandmother’s blessing or give up his spot. “I declare My Consent to a Contract of Matrimony between My Most Dearly Beloved Grandson Prince Henry Charles Albert David of Wales and Rachel Meghan Markle, which Consent I am causing to be signified under the Great Seal and to be entered in the Books of the Privy Council,” her letter read. The paperwork was officially released for public viewing over the weekend of May 11. In April, TMZ reported that Markle tried to fly under the radar when she visited the VFS Global U.K. Visa Application Centre in Chicago, but staying incognito proves tricky when traveling with four bodyguards. Eyewitnesses say Prince Harry’s bride-to-be was polite to the staff and was in and out within 10 minutes. To expedite the process and receive her visa sooner, TMZ‘s sources reported, Markle paid around $1,500. Although her visa will initially be for dual citizenship, Markle will be able to return in six months to file for permanent citizenship in the U.K., which Kensington Palace confirmed she intends to do. 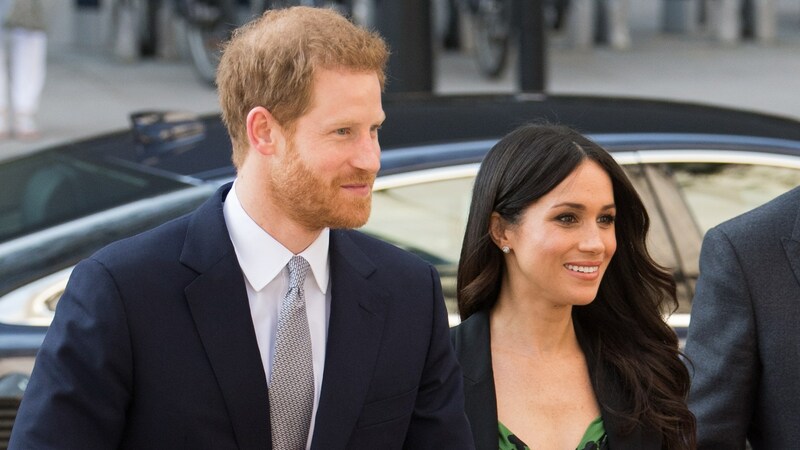 Of the 600 official guests who received invitations, Entertainment Tonight speculated that several of Harry and Markle’s celebrity friends made the cut. Since the Spice Girls’ Mel B already hinted at an appearance, the girl band could possibly be attending and performing. In turn, their attendance would likely herald a cameo from soccer king David Beckham. Other potential celebrity attendees include Sir Elton John, Serena Williams, Priyanka Chopra and the cast of Suits — notably, Markle’s on-screen love interest, Patrick J. Adams, and his new bride, Pretty Little Liars star Troian Bellisario. On March 28, we learned through Entertainment Tonight that Harry and Markle had sent out 250 invitations to members of the British Armed Forces for the royal wedding. In a statement issued by Kensington Palace, it was noted that there would be a special role for the servicepeople in attendance. “Regiments and units that hold a special relationship with Prince Harry will provide ceremonial support at the wedding and during the carriage procession at the request of Kensington Palace. More than 250 members of the Armed Forces will perform ceremonial duties at the wedding,” the statement read. ET provided additional reporting on some those duties. Members of the Household Cavalry will line the stairs at St. George’s Chapel, where Harry and Markle will be married. Also, members of the Windsor Castle Guard — which includes those who have served in the 1st Battalion Irish Guards, Royal Navy Small Ships and Diving, Royal Marines, 3 Regiment Army Air Corps, The Royal Gurkha Rifles and Royal Air Force Honington — who all have ties back to Harry, will line the streets of Windsor, the city where St. George’s is located. On April 10, the Daily Mail reported that the Obamas didn’t receive an invitation to the royal wedding — nor did current U.K. Prime Minister Theresa May or current U.S. President Donald Trump. Since Harry is not a direct heir to the throne, he doesn’t need to have such a formal guest list. That said, one might suspect the royal family doesn’t want to make a bold political statement by picking and choosing which heads of state they invite to the wedding. Over the weekend of May 11, we learned who will give the address at their May 19 nuptials. “Prince Harry and Ms. Meghan Markle have asked that The Most Reverend Michael Bruce Curry, the 27th Presiding Bishop and Primate of The Episcopal Church, give the address at their wedding,” Kensington Palace revealed in a statement. In April, Kensington Palace announced the name of the photographer hired for the big day. There was a fun report released via Vanity Fair in early April that the “secret wedding planner” and close friend of Meghan Markle’s, Jessica Mulroney, will likely be attending the royal wedding. Mulroney, a Toronto-based stylist specializing in weddings, is one of the top guesses for Markle’s matron of honor — while that’s unconfirmed, VF strongly believes she will be, in addition to covertly planning the major event. Vanity Fair also reported that Markle will have two custom-made wedding dresses. The first will reportedly be “an elaborate yet traditional bridal gown” for the ceremony and reception. The other dress is reportedly “a glamorous, more sophisticated” gown she’ll change into for the evening to “party the night away” with less restriction. Just days before the royal wedding on May 19, Elite Daily reported on the official lineup for the bridal parties. The respective bride and groom’s parties will be comprised of some younger faces than Americans might be used to seeing. Additionally, it was confirmed in May that, contrary to previous rumors that Markle’s close friend, Mulroney, would be part of the bridal party, the future royal had opted out of a matron or maid of honor. This is still mostly TBD! Rumors have included the Spice Girls, Ed Sheeran and Elton John, but we’re not 100 percent sure who could or would officially play at the wedding reception. However, in April, E! News reported that Kensington Palace has announced what kind of music the nuptials will include. “Both Prince Harry and Ms. Markle have taken a great deal of interest and care in choosing the music for their Service, which will include a number of well-known hymns and choral works,” the palace revealed. James Vivian, the director of music at St. George’s Chapel, has orchestrated several live performances to take place throughout the ceremony — think choral groups, soloists, acclaimed 19-year-old cellist Sheku Kanneh-Mason, the Christian gospel group The Kingdom Choir and more. Also, within hours of the service ending — according to Britain’s Decca Records — the music from Prince Harry and Meghan Markle’s wedding will be released on audio and be available on vinyl May 25. In mid-April, Kensington Palace revealed that Prince Harry and Meghan Markle have chosen a florist to create the church flowers for their big day. In another nod to the couple’s modern style, they chose high-fashion florist Philippa Craddock, who has previously collaborated with upscale brands like Hermès and Alexander McQueen. According to the Palace, Craddock will source the foliage locally, drawing largely from the gardens and lands of the Crown Estate and Windsor Great Park. The fair-trade florist will also try, when possible, to use flowers and plants that are in season. “These will include branches of beech, birch and hornbeam, as well as white garden roses, peonies and foxgloves. The designs will reflect the wild and natural landscapes from which many of the plants will be drawn,” says a palace blog post on the subject. It’s believed Harry and Markle will honeymoon in Namibia. Travel + Leisure magazine previously reported that the twosome will likely stay at Namibia’s newest luxury camp, Natural Selection’s Hoanib Valley Camp if the end up going. On April 11, the official announcement arrived from Today that they had secured coverage for the royal wedding. Among the Today correspondents going over to the U.K. to cover this spectacular event are Savannah Guthrie and Hoda Kotb, who will be doing a live show overlooking Windsor Castle, with Al Roker and Sheinelle Jones hopping in to do additional coverage. Additionally, PBS, CNN, and BBC America will be streaming the royal wedding and extraneous festivities on the special day for us Americans to enjoy. Are you ready for the royal wedding? It’s best to stock up on all your viewing party necessities because we’re mere days away from the big day!